Usually on this day I am writing about my life during the past year, but at the moment I am still trying to integrate my life of the last month. Quiet time for reflection consists of a few moments here and there as the miles pass, and then I am usually either writing or trying to knit on bumpy pavement. As we speak. Yesterday was fun as we looked up two different sets of friends that Mo had in Tucson. The first people, Joe and Joan, have been friends with Mo since she and Carol lived in Monterra in the 70’s, and were actually married at the ranch there. They lived in a typical Arizona country club, with winding streets and generic houses that went on for a long way, but their home inside was lovely and their xerixcaped gardens were great. They have only lived there for a little more than 2 years, moving from Grass Valley in California and they loved it. We visited with them at their home for a time before going to Wes and Gayle’s home just a few miles away in the same area. Gayle called while we were traveling and suggested that we all come there for dinner instead of trying to go to a restaurant. She said, “I’ll just throw something in a pot, so it’s not a bit of trouble.” Mo had thought that it might be nice for the two couples to meet, but till now that hadn’t actually happened. Wes and Gayle are Mo’s next door summer neighbors back in Rocky Point, but they are only there for 3 or 4 months a year and then come back to Arizona for the rest of the time, especially the winter. They had a truly lovely home on an acre or so along a typical Arizona arroyo with palo verde trees and cactus all around. The home was like something out of Sunset magazine showing contemporary desert living, with a barbeque patio that rivaled most kitchens I have seen, a big southwest style outdoor fireplace/over, with adobe walls and a beautiful waterfall. The waterfall was very similar to the one at Joe and Joan’s home, so I guess it’s the thing to do in the desert when you have no grass, you need some kind of water here and there. The inside of the home was every bit as memorable with all the southwest décor that is so open and full of light. There were big windows with views on three sides of the mountain ranges around Tucson and we watched the sunset while eating some kind of incredible appetizers made with corn tortillas, shrimp, avocado and cilantro with a great pepper kick. Gayle also made lovely Cosmopolitans, which were new to me and a surprise as well since I didn’t think I liked vodka at all. Could do that again! From appetizers in the living room we ambled to the dining room for a meal that was surely more than “something in a pot”. We had some kind of famous southwest chicken soup called “posole” that had hominy in it, but it wasn’t anything like the hominy I remember because this was really really good. They also served corn salsa, and green corn tamales that they brought back from Puerto Vallarta, beef tamales, and chicken enchiladas. After dinner she brought out the liqueurs with desserts and a can of whipped cream which made us all laugh. It was fun. It was nice that everyone had a chance to get to know each other and I got to know Wes and Gayle a bit better so that when I get back to Rocky Point and they are there it will be fun. Gayle likes to walk and to play “hand and foot” so that’s a good start. Although her heart is here in Tucson so they may not be going back to Rocky Point many more times. We stayed at a park called Cactus Country RV, which was just off I-10 near Houghton Road east of Tucson. It was a great choice, with really friendly staff, and in spite of being very nearly full, it was incredibly quiet. Maybe it was the direction of the desert wind, but I never heard a sound from the freeway that was about ½ miles south of us. Also, they have the night lighting restrictions in place in this part of Arizona as well and the sky was dark and brilliant with stars since the moon is in it’s waning phase and wasn’t up yet. It’s interesting to see how we are treated in different parks. Most of the parks are geared to wintering snowbirds with lots of activities and amenities for long term stays. As a result, short timers or overnighters aren’t treated as well now and then. In this park, though, there was none of that, and I would definitely go back and stay here if traveling through Tucson, and if visiting would choose this one as a home base. A day later and the story is similar, at least for the moment. Driving west on a 2 lane Texas road with very little traffic. We took a side route off I-10 to get away from the big trucks and the wind, driving north on Texas 54, the “Texas Mountain Highway”, which is the main route north from the Interstate to the Guadalupe Mountains and Guadalupe Mountain National Park. It’s also the route to Carlsbad Caverns. Yesterday we decided to pull off the highway in early afternoon so that we could get some groceries and set up before dark with a bit of relaxing time. Couldn’t make it all the way to Las Cruces so figured we could stop halfway at the only town of any real size between San Antonio and El Paso, Fort Stockton. Fort Stockton didn’t have much to speak of, except the visitor center was actually open and also built from the large lovely limestone blocks that are used throughout this part of Texas. The proprietor there was a very old man who was very kind and helpful and gave us RV park lists, maps, and a great brochure on the Texas Mountain Country. Seems as though we unexpectedly were on the edge of another interesting area of Texas, one that will need further exploration another time. But in the mean time, the important thing was food and rest, so we decided on a funky park south of town called Parkview RV. From the highway it looked really terrible, and yet once set up and inside our rig, it wasn’t so bad. First thing to notice was all the telephone poles and wires. Most parks now have underground utilities, so it was strange to see all these ugly things everywhere. The bathrooms looked as though they were made of old cardboard, and the spaces were just gravel and weedy grass full of burrs and stickers, another thing that has been a real pain in texas, the goathead burrs. But the park had the fastest wifi I have had in some time, cable tv which we seem to never manage to watch, but always think we want it, power, water that tasted good, and sewer, which we ended up not using anyway. Our tanks are still only less than 1/2 full after 4 days now, including our boondocking night, and we haven’t emptied them yet. Lots more storage space for water of all types in this rig. Haven’t had a pizza since we left a month ago, and pizza is one of the favorites around here, so we bought DeGiornio’s rising crust and decided to give the new oven a try for something more complicated than baking a potato. Worked great after I got the hang of the warm up cycle, and it’s really nice to have a real oven to cook with. Took a little bit of time to fiddle with things and get more settled in for the evening, went for a walk with the dog, and took some photos of the sunset before settling in to write and upload photos and watch a little bit of news. Walking through the park I got to do one of my favorite things which is looking in people’s windows at dusk while they are doing life. Crazy thing, I know, but I love it. So walking by an older rig I saw a sweet older couple all cuddled up on their sofa watching TV. They waved and smiled and I waved back thinking, ahh, the rv life, not a bad way to retire if you have someone who loves to do it with you and who cares about you as well. They seemed so contented in their cozy little space, and so friendly with the windows all open. The night was cold but not as cold as some have been on the trip, but the insulation in the back of this rig isn’t enough to keep it warm in the bedroom portion and I kept waking up with a cold head. Guess I have to get an old lady nightcap or something, because I couldn’t sleep. I’d get all hot under the covers, and whatever I stuck out would get all freezing. Finally got up at some ungodly hour and turned the heat up, but still couldn’t get my head warm. Then Teddy decided it was time to play and visit and work on his security issues, stepping on our heads and crawling around yowling for a few hours. I kept wondering why I wanted to find him anyway. He seems a bit traumatized and sleeps hidden all day in whatever space he can find and then wanders around from window to window for a good portion of the night. Hopefully after a bit he will settle down again, but at the moment he has found the space under the sofa between the wall of the slideout to hide and is sleeping there soundly and won’t budge. I decided I needed to harass him all day and keep him awake, so I closed up his cage where he usually hides, but he seems to have found another hiding place after all. Think I’ll go bug him soon. Morning came, still dark at 7am because we are so close to the time change boundary into mountain time and I got up and made coffee and started planning the day. Heading for Las Cruces now and there is a great park that we hope to stay right within walking distance of Old Mesilla, the historic part of Las Cruces. The drive west from Fort Stockton has been wonderful in the way driving in the open desert can be wonderful. There were lots of mountains, shadowed desert kinds of mountains, all along the interstate and then when we headed north it was really dramatic for a time. The landscape changes a lot, but it’s fun to be back in an area that I was in 5 years ago when I went to the Soil Science Geomorphic Institute in Las Cruces. Once again I have some familiarity with the landscape, the vegetation, the natural story of this place and that feels good. I’m looking forward to seeing the Rio Grand valley again, and the Organ Mountains. As I remember in this part of the country, once again the sky is perfectly clear and blue and the sun is still straight up, not a shadow anywhere is the white hot light. And it’s December. Highway 54 was a great way to get north and now on 62/180 going west we have skipped all the boring interstate stuff and truck traffic, and even though there is an occasional car and truck, it’s still relaxing and fun to do. Probably adds about 30 miles to the distance to El Paso, but well worth it. Mo filled up the rig for the first time and the numbers don’t look that great. At first it looked like 8 mpg but hopefully that figure is skewed by the fact that we ran the generator quite a bit the night we were boondocking. We will fill up again all the way the next time we get gas and hope that the numbers go up somewhere in the vicinity of 10 mpg at least. The Baby MoHo got about 10mpg when she was towing the baby car, but that was 10,000 pounds and a ford 350 and this is 14,000 pounds and a Ford 450. I guess we will see how that one goes. Both of the engines are V-10’s, and never seem to be short on power in any situation, so that’s a good thing. Not like some of those old motorhomes that you see lugging down on the hills. Will have to wait for the western mountains I guess to see how she does on a really steep pass. At the moment, just before 1pm on a Saturday afternoon, we are driving west on HWY 190, which up until now has been a pretty good two lane road. The most unique feature although, is the complete lack of company of any kind, including traffic or cell towers. It is utterly straight, utterly flat and utterly repetitious. There is brown grass and some kind of low tree that has no leaves. Occasionally there is a patch of prickly pear cactus or a dead deer. Have seen at least a dozen since we left Llano, which was a cute little town just a few miles north of Fredericksberg. Fredericksberg and Llano were actually on the western edge of what is called the Hill Country of Texas, a general area west of Austin, north of San Antonio, and east of our route through the area. There seems to be a lot to do around the area, and the number of Texans wintering in their motorhomes and rv’s was astounding. Fredericksberg itself was a great little historic German town of around 8,000 people and a lot of cute shops and a few good restaurants. Publicity says it has the best Octoberfest west of Germany, and the Volkwaagen walk in November also draws big crowds. We drove a few extra miles to see the famous Enchanted Rock, which is a huge batholith of pink granite extending up from the surrounding limestones and offering a view of all the surrounding hill country if one is willing to do the steep ½ mile hike, which we weren’t this time since the western road is beckoning. But there were some other state parks for hiking, some rivers and lakes for boating, and many small towns to explore, with a reputation for really good live music and shopping. Of course, shopping, it seems that Texans really love to shop. I can see going back to this place in Texas, especially in April when the famous bluebonnets and wildflowers are in bloom. The Visitor’s Center in Fredericksberg was actually open and was a lovely limestone building, full of light, airy, and crafted with European/German finesse. There were plenty of maps and brochures, good parking, and helpful people. A good place to check out if you are traveling in the area. But driving west things begin to change. The lovely low rolling hills slowly give way to flatter limestone area of truly big nothing. That’s were we are right now, and Mo is driving so that I can return to my thoughts and write about the misadventures of the last couple of days. I spent a large part of this day remembering sadly how recently I had written about how wonderfully easy it was to travel with cats. I also spent almost all of this day in tears, big sobbing tears that I couldn’t stop. If something dies, it’s over, you cry, but you can begin the healing process as soon as it’s done. But something lost is so different. When do you give up? When do you say it’s time to go? How do you know that maybe the sadness will all end any moment and it will all just become a story? And of course, the guilt is huge. How could I have done this? How come, when I have been so incredibly careful for a month could I have let him slip past me? Over and over the questions, walking the park, calling, calling, crying, walking some more. It started in the morning, while cooking breakfast. The new house has nooks and crannies, as well as a leather hide abed. Anyone with cats knows how much they love to crawl up into those things, and what a pain it can be. We ate breakfast, cleaned up the house for moving again, checked all the closets, and thought of course Teddy would show up in the hide abed. So we moved everything around, opened the thing up, and omigod, no Teddy. It was a shock, because the MoHo felt incredibly silent and Jeremy just looked at us reproachfully. We tore the place apart, again and again, thinking there must be something we missed, there is just no way he could have got past me when I let Abby out. Yet, there was no cat. There really was no Teddy cat in the MoHo. He was gone. So the walking and the calling began. 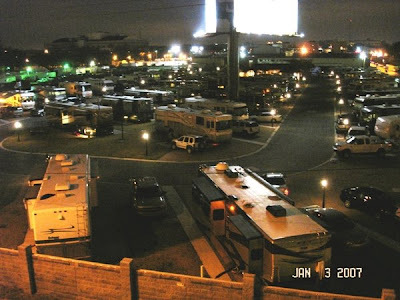 The worst part was that the RV Park was full and the management insisted that we had to move from our space by noon when the next people were coming in. I cried to no avail, imaging Teddy finally returning to find us gone. I walked everywhere, to the ponds on the south side of the park, to the old wood piles on the west. Everywhere. I met Rene Rios, the maintenance man, with dark soft eyes and a mustache and a gentle accent. He commiserated with me, another cat person, and said he would get his girlfriend to help as well. More walking, more calling. I just knew he had to be hunkered down somewhere waiting for the dark, but then what if what if??? And I had to move out!!! Finally I walked to some empty fields behind the rv park and there was a funky gas station and an old junk yard full of old trucks and such. The truck owner offered to help, and then the service station manager said that we could park the RV and dry camp in the station for the night so that we could keep looking for him. Big sigh of relief finally on that one and still no cat. A bit later, as Mo and I were walking and calling, we came upon a young woman also calling for Teddy. She asked, “Are you Teddy’s owner? “ and when we said yes, she told us she was Rene’s girlfriend, Sandra, and she was walking the fields looking for Teddy. Amazing. We could see Rene in his little golf cart going around the park looking looking and calling. But Ted was gone. I thought suddenly of his leather collar and bell, not a cat safe collar because he is never outside, and then even worse, of his bright orange and blue toenails, covered with the fancy caps that Mo and I just finished gluing on last night so he wouldn’t damage the new leather sofa. He wouldn’t be able to hunt or climb or fend for himself. The only good thing at all is that I was discovering that there were a lot of cat lovers around there and that people would at least know that he wasn’t a stray. More calling, more crying. The day was passing and by late afternoon we decided to unhook the baby car and go up to town to see Fredericksburg, the reason we were there in the first place. I laughed sadly and told Mo, at least she didn’t have to worry about me getting all excitable and crazy in all the shops. We walked up the streets and looked in a few places and finally found a truly wonderful little restaurant that had been decorated in amazing warm colors and had a fabulous meal of comfort food. I was able to stop crying a bit and actually appreciate the meal, thinking, it can’t fix it, but it can make things feel a bit better anyway. After dinner we headed back to the MoHo, and on the way I had a thought. The previous night, a wooden panel in an area above the bed had come loose. Mo had pushed it back up, and I asked her what was behind it. She said, nothing, she thought it was flat. When I got back, I said let’s check that out again. Sure enough, there was open space behind the panel and in great excitement, I said; let’s check the back storage area!!! We were thrilled and opened it up, but sadly there was nothing, no cat, and no opening to the guts of the MoHo either. About that time Rene drove up to see how things were doing. I was looking at the back of the MoHo carefully when I realized that there was empty space on either side of the rig that was tall and narrow and just perhaps accessible behind the ceiling panel that had fallen. I asked Rene to come and take a look and we were all getting more and more excited as we realized that teddy may very well be caught in the interior guts of the rig somewhere. Now I have to say, that all day long I had been praying to St. Anthony, the patron saint of lost things, introduced to me so long ago by Eva. I don’t remember the exact prayer, but when you say it, you promise to give to the poor. I was promised, and I was promising not my usual 10 or 20 dollars, but 50 dollars and promised to someone I didn’t know at all! The excitement was mounting as we circled the rig, trying to figure out a way to get to those hidden parts, when suddenly, there it was, Teddy’s unmistakable voice, coming from that inaccessible dark part of the new rig. I was so happy I thought I would burst. Rene said, “Let’s undo the tail lights”. We did that, and teddy crawled out of reach and out of sight into a completely inaccessible area, but when Rene reached up in there, he could feel him but he was just a few inches too far. We went back inside, and quick as a wink Rene grinned and said, I’m going in. He knocked out the safety exit window so he would have more room and climbed right up into the hole and bent his body around till he could see teddy. Ted, of course,, was having none of it and kept his distance. We tried using the vacuum hose, and that didn’t work, and finally we ran the broom up one taillight and Rene used that to push teddy down the other side and out the other taillight. There he was, yowling and howling one big bundle of teddy fur. Unbelievable, just completely unbelievable. I told Rene the St Anthony story and asked if I could please give it to him and he didn’t hesitate when he smiled that cute grin and said sure, thanks. By then the owner of the park showed up, all pink and blond and shiny in her new white truck telling us that there was a cancellation and that we could come back to the park. But we said, thanks, no thanks, and we will just hang out here and boondock for free. I wasn't about to give her my 30 bucks after all of that. I went into the house then, hugging teddy while Mo and Rene put the MoHo back together. I hugged him tight till he yowled in protest, rubbed my nose in his fur and said thank you thank you thank you. So what could have been a really sad end to a great trip turned into a truly great cat story! Today Moana took the day after Christmas shopping to a new level. We left Austin early Christmas morning to travel the great distance to New Braunfels, all of 60 miles. The weather was still clear and lovely in spite of the winds. The campsite we had chosen for this adventure was on the Guadalupe River, a place my sister also talked about and she was right, it is lovely. The campground was about 20 miles off the interstate at a place called Canyon Lake on the Guadalupe River. The place was called the Lazy L and L and for no reason I could figure out, it was very nearly empty. We found a spot among more than 100 with no one there except for 3 or 4 rigs way down at the opposite end. It was a perfect place for our scheduled work of the day which was getting the MoHo all tricked out and ready for a trade in. When Mo bought the Lexus last year she traded in her Blazer and we had been traveling in it with the dog who had licked all the windows and everything was all musty and she probably lost some dollars on the trade in as a result. We were making sure that didn’t happen this time, so spent the entire afternoon clearing out the MoHo, cleaning faucets with a toothbrush and q-tips and by the time we were finished there was barely time to eat the reheated supper and watch the river a bit before crashing. This morning we made sure we were at the dealer when he opened at 9 and he already had the new Dynamax out in the back waiting for us. The negotiations were straightforward and not as long as might be expected and by noon Mo was the owner of a new Dynamax Coach. It’s just a hair over 25 feet long, only 4 feet more than the MoHo, but boy such a difference that makes. It’s like a Lexus version of a motor home, truly lovely and convenient and with all the bells and whistles. I have loved the baby MoHo, but this is like a dream thing, and yet still small and sweet, short enough to get into the parks, but just a bit bigger than the baby house, just enough that we don’t have to quite do the juggle of moving things around every day when we park. There is a slide-out with a leather sofa, and a kitchen that I can actually cook in, and a shower that doesn’t have a toilet in it. That’s pretty nice. We drove it this morning on the freeway in high winds and it rides like a dream, and doesn’t feel much different than the MoHo in that way either. It was supposed to be ready by 4 so we took the baby house to San Antonio and did the River Walk, ate lunch in the Mercado at the oldest restaurant around that was an experience in itself, and then walked to the Alamo. Place where Davy Crockett fought and died. San Antonio is filled with really old historic buildings and churches amidst all the new ones, and isn’t nearly as glitzy as Austin, but somehow it felt much better to me. I am not sure why there were no homeless people around, except perhaps they are elsewhere, since the people in most of San Antonio seemed to be a bit poorer so maybe everyone was in the same boat. There were some empty buildings here and there, closed up storefronts, but there still was good energy about the place that I enjoyed. The town itself also felt much more historic than Austin, and much more Hispanic in a different way. Maybe it was combination of the Mercado and the Alamo, and the fact that I didn’t see endless hills covered with huge houses. The area around San Antonio can be pretty boring, but the valleys along the Guadalupe River are lovely and there are bluffs and canyons in the limestone and sandstone that are dramatic. Back through traffic and an accident that slowed us down a bit, but in the end it didn’t matter because the new MoHo wasn’t quite ready. Did the walkthrough and learned about all the goodies and finally the dealer offered to put us up in a really nice park so we wouldn’t have to do the move from MoHo 1 to MoHo2 in the dark. Both of us were pretty tired by then and the cats and dog were tired of being in the Geo all day while we did the dealing, so we took the offer and headed for one more RV Park. This one is called Hill Country RV and for some completely unknown reason it is full to the brim. Full to the point that the site they gave us was already filled and there weren’t any others until someone went driving around to find something for us. Saw a flier that said the rent was 285 a month so that explained why the place will filled with full-timers. Who knows how much a month would cost on the Guadalupe River, but I would much rather have been there than here by the interstate in New Braunfels. Who knows, when you are retired and full timing in the winter, maybe having MacDonald’s and Wal-Mart close by are a plus instead of a wild river. There are some things that I have been thinking about that just never seem to end up in the story of our trip. Cats and helpful people. Traveling for a month in a very small motor home with a dog and two cats might sound like a recipe for some kind of disaster, or at least a tense moment or two. Instead it has been simple and fun. The cats both have taken to the routine as if they were born to it. I have their small cat cages with me, and whenever it is time to hook up, or if we are gassing up or doing anything that requires open doors I pop them in the cages. They seem to like it actually, and during the day if the cages are open as we are driving they go in them to sleep and feel comfortable in a safe space. During the days on the road, they are free to roam around the motor home and Jeremy will come and sit in my lap or perch on the dashboard to watch the passing scenery. Teddy usually hangs out in his cage or in the dog bed for the daytime and then happily jumps on the bed for nights. He loves to be by the open window and smell the outdoors and watch whatever magical things are running around in the moonlight. I also brought their bigger crate that I can set up outside on a picnic table when we are doing something outside and they love to sit in there and watch all the birds and whatever else is going on. Funny thing is that they also love to jump back into the safe motor home whenever they have been outside a bit. Every once in awhile, Jeremy especially will keep checking the doors to see if he can make an escape, but is easily discouraged if I speak strongly to him. The cat box of course is the other thing that seems as though it could be a real pain, but I bought a special one that is deep and has a lid with a circular hole in the top. Someone uses it and I clean it, so things are always clean and nice, and the design of the box keeps litter from scattering as well. Cat people will understand this one for sure. I can’t believe just how easy it has been to travel with them. The other part that has been fun is that I have had more time to spend with them than I do when I am home working and I think that may be what they like about the whole thing as well. People. I have experienced some really interesting people on this trip, especially in the south. Everyone seems really kind and really talkative. If I ask directions or for some kind of information, every one is willing to help, usually with long and complicated and very explicit directions, and then with some more conversation until I wonder if I will manage to get on my way. At the Laundromat where I walked in to read my maps, I was approached by an old guy in beat up clothes and a friendly smile who said, “Can I help? I used to be a cab driver around here” He then proceeded to give me careful directions as to how to get back to my campground without missing a step. He shook my had and patted my shoulder and it didn’t feel the least bit threatening. Today in San Antonio, several people offered helpful directions, and the one thing that is constant, is the length of time everyone is willing to take to explain and converse and talk at length after the simple directions are given. Friendly people are what I will remember of this trip I believe. Christmas Eve dawned crisp and clear, warm enough for capris. Headed for the att phone company downtown which turned out to be across from the Market and Seattle’s Best Coffee. Was treated to a really superior salesman who handled everything related to my phone with style and grace and went over to have a coffee and pastry while waiting. Looked over our list of the 10 best things to do in Austin and tried to plan the day accordingly. First on the list, after getting a phone of course, was to check out Town Lake, or Austin Lake, which is part of the Colorado River that flows through town. This part of Austin is truly delightful, with greenbelts, and I think the entire city was out running or walking or rowing or biking along this beautiful parkway. Next on the agenda was the State Capitol, but since it was a state holiday we only got to see the grounds and exterior, which were lovely, and didn’t have to pay parking to boot. Drove south on Congress Street to the SoCo area which is eclectic and filled with shops. One thing about Texans, they love to shop, and many of the “best things to do in Austin” are related to shopping. SoCo was quiet on Christmas Eve however, so we just drove by and looked as we continued on to Barton Springs and Zilcher Park. This truly is a best thing to do in Austin, the location of the fall Austin City Limits festival and more than 300 acres of paths, trails, picnic areas, an arboretum, sculpture gardens, and the river flowing through the middle. Barton Springs is a natural limestone spring in the middle of Barton Creek that has a long pool, 1/8 mile long, 68 degree water and crystal clear blue colors. People were actually swimming! Down below the pool was a natural area of the creek where there was shallow water and a gentle current where Abby played in the water and swam for a long time while I tried to catch up all my phone calls since I finally had a phone again. Christmas Eve. We had a park hot dog there and continued on reluctantly to our next adventure on the 10 things to do in Austin. Next adventure was to drive out to Lake Travis. This wasn’t anything like I had imagined the Austin area to be like. It was huge and developed, and the houses were bigger than anything I have seen in California and covered the hills all around the city for miles and miles. The hills were covered with ugly oaks and junipers with very little open space and the lake itself was a huge but very long narrow body of water that was basically invisible because of all the development. We drove many miles through this ugly stuff, all generic, and it felt a lot like it feels to drive through suburbs of LA. We were in the Geo and the roads in spite of the development were rough and bumpy, the sun was glaring and the driving gave Mo a headache. A rare thing. Couldn’t wait to get out of there. Once back in downtown Austin, we tried to find a place to relax and have a pizza before we went downtown again for some music and then later to a Christmas Eve service. But don’t ever try to find a local pizza on Christmas Eve, we drove and drove up and down the main streets of Austin, north on Guadalupe and Congress, back to South Congress, back and forth on 5th and 6th and nothing. Finally, at the far end of town up beyond 37th street there was a Chili’s, so we gave in to generic and had a great supper there and a celebratory glass of wine. At 7 we drove downtown to the bar that was supposed to have some live music, but once more internet advertising proved to be wrong and the bar was dark. So we drove back over to the St David’s Church where the 6pm service was ending and the 7:30 pm service that was advertised wasn’t happening and we had to wait until 8 to go to the later service. This was a part off Austin that is the central gathering area for the homeless, there is a large distribution point just 1 block east of the church and lots of people milled about asking for handouts. It was a bit scary in the dark, and we parked on 6th street and tried to be sure we were careful around the alleys. I know better than carrying anything when in the city in the dark, but stupidly I had that huge cat lady bag and didn’t want to leave it in the Geo either since it had my phone, my money, everything. So off I wandered through the dark streets, watching the alleys furtively with my big old lady Laurel Birch cat bag held tightly under my arm. We walked up 6th a ways to find the Driskell Hotel, a truly magnificent building that was decorated beautifully complementing the many stained glass skylights and huge pillars in the lobby. The hotel was an historic one, and had the distinction of being a favorite hangout of LBJ, and was the place where he and Ladybird had their first date. The church was an old one, an Episcopal church, and really quite lovely in it’s simplicity. There were also many stained glass windows but at night you couldn’t see the colors, just the images that were there. When the service started there was some great music, a soprano soloist that was sweet as something celestial, and a big pipe organ. The Episcopal service was much like what I remembered from my days going to Catholic Midnight Masses with my grandmother, except that it was all in English instead of Latin. The procession was beautiful with the choir members walking the aisles holding candles and singing. Even the sermon was delightful with the woman who was the presiding bishop speaking in tones that were calm and poetic. I told Mo that if church had been like that when I was a kid I might have really loved it. No guilt, just lovely music and soft kind words. I didn’t feel one bit of the negativity that sometimes overwhelms me in the presence of patriarchal organized religion. It just felt ritualistic in a good way, remembering somehow the good parts of it all. Left the church and wound our way home back through the Hispanic neighborhoods, enjoying the lights and sounds and especially happy to return to the little house waiting at the HWY 71 RV Park. December 23 on the road again heading for Austin to spend a couple of days exploring that famously eclectic city. Found the campground along HWY 71 after a few fumbles early enough that there was still time to go into town and begin to see what all the hoopla is about when people talk of Austin. The HWY 71 RV park is on the southeast side of town, which is the older part of Austin and there were a lot of Hispanic neighborhoods as we drove through this older part to get to downtown. Again, a big advertised visitor center for the city, supposedly open till 6 had a note on the door that they had closed at 3pm. Another big sigh until I managed to get the attention of a woman inside who grudgingly handed me a map of the city through the old door. The visitor center is right on 6th Street, what is know as the bourbon Street of Austin. This time of year and this time of day though was less than exciting except for the many homeless people all around. There were several bars and some older looking buildings but with the University of Texas on break and most families home for Christmas, it was pretty quiet. Found a neat old Irish Pub in an historic building that had an original bar that had been assembled and disassembled in Dublin before being brought here and rebuilt here in Austin. Had Irish Coffee’s and bar food while three footballs games broadcasted at once on the big screens, while checking out the Austin map and planning where to go next. One of the things I had read that was not to be missed in Austin was the Whole Foods Market, the main headquarters for the famous food chain. Downtown Austin is pretty easy to navigate with numbered streets following sensible block patterns unless they run into a river or the capitol or something like that, so finding the store was easy. And what a store it was. I walked in while Mo tried to park and was awed and overwhelmed. It was every food lover’s delight, with acres of wine, miles of cheeses, walls of olive oil, and rows and rows of bins of nuts, seeds, and grains. The store was as big as a Wal-Mart but seriously high end. The people were filling the aisles and overheard conversations were fun, especially the woman counting on her fingers as she eyed a huge ham. The meat section was every cooks dream, with tenderloin filet roasts that were 25 bucks a pound and about 2 feet long and huge crown roasts of pork with all the cute little hats on the end bones. By the time I made it to the salad bars, I was completely overwhelmed with choices, and there were several separate little food bars where people were eating different varieties of food. I have never seen a place like this. The final topping to the extreme nature of the market was the ice skating rink on the roof, where people from Austin came to ice skate as a part of their shopping Christmas experience. Amazing. After that it was late so traveled back through town watching the moon rise over the Capitol and then across the river to our little park back 20 miles south in Bastrop. There are no words for 37th Street in Austin at Christmas. It's just a small short street in an ordinary neighborhood with an amazing history of people coming together to do something special. Mo and I read about it in the 10 best things to do in Austin, and decided to go find it. It really is the BEST thing to do in Austin at Christmas. Don't miss it. Pictures can't catch it and words fail me. Tacky, crazy, glitzy, and completely out of control and completely wonderful, we walked 37th street with hundreds of people and were delighted as children by the lights and colors and laughter. On Saturday we left New Orleans early and continued westward through Louisiana. Following the historic Old Spanish Trail HWY 90 was the plan so that we could see more of the real area rather than the artificial world of the Interstate. The real world of Louisiana is certainly not a place I need to see again, and the rough roads made it feel like I was riding a bucking bronco most of the day. Took hours and hours to go just 150 miles and the day was supposed to be an easy 300 miler but at 3:30 in the afternoon there were still 15 0 miles to go. Not a fun thing when it’s windy and trying to find the RV park and set up in the dark. After watching many miles off trashy trailers and garbage and dumpy stuff along the old highway we bailed and got on I-10. What a relief that was! The trash gave way to open road and scattered off ramps with the general generic stuff, but at least it was clean. A bit of a bright spot in the morning included several miles through the swamps off the gulf coast. Found out that the difference between a swamp and a marsh has to do with trees in the water versus herbaceous plants in the water. The swamps were endless, with bayous appearing occasionally. Also found out that the official definition of a “bayou” is a small waterway off a larger waterway with slow moving water. The bayous we passed were trails winding off into the swamp, but didn’t see any boats or people in them, and more often than not there was floating trash. Sad. Stopped in an historic town called Morgan City, looked for the Visitor Center which for no explainable reason was closed even though it was listed as open. Christmas, I guess. Wandered through the town to search for historic buildings, and found a huge seawall holding the river back all along the main street, which actually had nothing off interest at all. Maybe the view of that huge blank seawall was the draw, who knows. Found an alternate bridge over the river that looked pretty scary, in bad need of a paint job and left the burg behind as we continued west. Keeping to the HWY90 route gave the opportunity to travel to Avery Island, another bright spot in an otherwise fairly dismal day. Avery Island is the home of the Tabasco Plant, and consists of thousands of feet of old salt dome that forms a hilly landscape that stands out dramatically surrounded by Louisiana flat wet fields. Took the factory tour, watched the video, walked the lovely grounds, and checked out the Tabasco Country Store. While there a couple of guys showed up on bicycles who left San Diego about 20 days ago. Hmmm, same as us in a motor home! They were headed for Florida and it was fun visiting with them for a bit. Tabasco sweet pickles, silk scarves, tee shirts, and recipes filled the store and tasting Tabasco flavored vanilla ice cream is an experience quite unforgettable. I didn’t buy any. Leaving Avery Island, however, takes you back into the Louisiana boring flat dirty stuff, so getting on the freeway again was a good thing. Finally crossed the state line into Texas at sunset, and it was one of the longest sunsets I have seen. The glow just lasted forever. We both laughed because the minute we crossed into Texas things started feeling better, more familiar somehow, more western, more open. Amazing that even Texas could feel good. Drove by Vidor when my sister used to live and opted out of a side trip to the gulf coast because of her vivid descriptions of smells and trash on the beach. I have seen enough good beaches that I didn’t need to waste time to find out about this one. Thanks Sal. The campground we chose from the CampClub USA book was right along the freeway, was open, was very small, called Turtle Bayou. The proprietor was a very friendly older man full of helpful conversation and offers off assistance as we set up for the night. The space was right at the front of the park, a pull through so we could get going fast in the morning, so it wasn’t until we left the next day that I saw the really pretty bayou right there in the park. This morning we woke and made a plan for “what to do in New Orleans if you have one day” from the Frommer’s internet site about the city. The plan worked fairly well and we walked to the French Quarter and began out day with Café au Lait and bignettes at the famous and historical Café Dumonde on Decatur Street. Classic New Orleans experience, with lots of street actors, street art in the square, and people sitting around drinking coffee. Then a walk along the Mississippi on the Moonwalk to the ferry that took us across the river to Old Algiers. Didn’t get off the ferry and just rode it back, but got a great view of the city from the river and some historical information about Mardi Gras displayed well in the terminal. The fog was lingering, in fact it never lifted all day so I bought a warm fuzzy jacket that said “bourbon street” and we explored some of the shops on Royal Street and ate the traditional “Muffaletta” sandwich at a restaurant that was probably as old as the city itself. The sandwich is a treat of ham, pastrami, salami, some cheeses on a soft big round seeded roll with olive salad pickles and peppers piled high. One was plenty for two people and the internet search had already warned about this so it wasn’t a surprise. Walked through the French Quarter winding our way home and had a chance to visit the oldest above ground cemetery in the United States at St Louis Cemetery. It was fascinating, and in the fog made for way too many photo opportunities. We even found the tomb of a big family who emigrated from Malta in the late 1700’s and produced some very prominent New Orleans citizens. We took a nice long break at home, reading and watching some tv, resting our feet, writing, and left on the little golf cart one more time to walk to the Canal Street stop for the street cars that go to the Garden District. The St Charles streetcars are historic electric trolleys, just like the ones in San Francisco without the hills of course. Interestingly, most of the passengers were local working folks and not a lot of tourists. Another noticeable thing about the part of New Orleans that we visited is the lack of Hispanic people, The news reports that the black folks aren’t coming back and the Hispanics are here now, doing the work, but most of what I saw in New Orleans were black people. The streetcar took us to the Garden District where the houses are huge magnificent southern mansions with their very own New Orleans character. Walking through the streets reminded me so much of the novel “The Witching Hour”. Reading that story by Anne Rice was so graphic to me, in her detailed descriptions of the sights, smells and feeling of New Orleans in the steamy summer. The Anne Rice house called “Rosemont” is right there where I walked on First Street but I neglected to look up the address before our travels there. Looking at the photos later on the internet, though, showed her home to be similar to many that I saw in that neighborhood. It was the house that she wrote about in all her books about the Mayfair witches. Made me want to read the book all over again, but at the moment I am reading Gone With the Wind and thinking about Charleston and Savannah as Margaret Mitchell writes about them with a new mental picture. Rode the car back to town and began the adventure of Bourbon Street in the early evening. What can I say, it’s Bourbon Street. The most famous on-going party in the country, I guess. I can’t imagine how it must be late at night or especially during Mardi Gras, but it was enough for me to see it as I did, in the early evening. We had a Cajun dinner at Le Bayou while watching the people walk by on the street, most of them laughing and carrying their plastic beer glasses and making a lot of racket. Stores filled with kitchy stuff, a voodoo shop, and of course the bars, bar after bar, all pouring music into the streets, and hotel rooms above the bars with people hanging over the rails made for a great image of what New Orleans is all about. Drinking, I think, and maybe eating is next. I’m glad I got to see it, and probably don’t have to do it again, but it was fun. Wandered back through the streets to the “safe” information center where we phoned the golf cart to pick us up and ferry us across the dark empty abandoned parking lot to our home. Very tired even though it wasn’t that late, but glad to be done and glad to have seen New Orleans In a Day. We packed up early this morning and didn’t take much time to get ready since we took showers in the heated and lovely state park bathrooms right next to our campsite in addition to having a pull-through site eliminating hook-ups for the baby car. The white sand was so lovely on the beach, but a bit less so stuck to everything. The sugar sand actually sticks like sugar if there is the least bit of moisture in the air, and there is ALWAYS moisture in the air! We drove west on HWY 90 which is the Old Spanish Trail and actually traverses the southern US from coast to coast. Driving in Panama City Beach was the Florida From Hell that so many people equate with the state, Mile after mile of high rise condos between the road and the beach, with limited views of the water and kitchy stores and bars and seafood restaurants. We kept trying to find a place to go for a walk with Abby along the beach, but all the access points said no dogs. Finally we stopped along a place on the Inland Waterway and made grilled cheese sandwiches and let abby run a bit, but it was windy and really too cool to enjoy much, and the waterway water isn’t nearly as clean and beautiful as the beach water. Finally stopped at a County Beach park along 30A near Destin for my white sand beach fix. There were huge high rises all around that were built in the Italian Villa style, pretty ritzy area, and still no dogs allowed on the beach, so Mo walked abby along the walkway while I went down to the beach. The wind was blowing hard, but warmer, and the sky was filled with long slim clouds. Suddenly as I turned to the Gulf, it was as though I had stepped into another world entirely. Everything behind me became irrelevant in the view of the pure crystal water and perfect blinding white sugar sand. In the wind I couldn’t hear anything at all behind me and as long as I was on that beach I couldn’t see any of the buildings. Just water and sand. It was a truly magical moment and illuminated for me the draw of that area that looks so awful when you are on the roads, and yet it’s filled with row after row of condos. People just go there for that beach, that water, that sky, and like me, when they are sitting there watching that water, all the development becomes irrelevant. It was a magical and eye opening moment for me. We continued along the coast trying to get through Destin and Pensacola, with mile after mile of busy roads and 4 lane highway with traffic signals. It was starting to rain and we approached Alabama in a deepening storm. The rain started coming down in buckets with the side roads filling up with brown muddy water and the wipers struggling to keep up. Mo held on to the wheel while the rain poured and the lightening struck here and there. It continued like that all the way across Alabama, so we didn’t really see much of that state except for rain and mud and more rain. Into Mississippi is was much the same way, but we decided to stay on HWY90 hoping that we could see a bit of the Mississippi coast. Approaching Biloxi, the rain continued, but started to lift just enough that we could see the devastation left behind by Katrina. The waterfront area across the entire state of Mississippi was gone, just completely gone. There was sand and mud at the same level as the gulf all along the highway, just flat, with construction cutting the road down to a single bumpy lane with big piles of sand that would appear unexpectedly. On the left was the gulf, and on the right was the most eerie landscape I think I have ever experienced. Mile after mile of neighborhoods, with driveways, and street signs, and huge old live oaks, still alive, but nowhere was there a house still standing. No street lights, to telephone poles, just these driveways going nowhere, and then a big casino would appear all lit up. I guess they rebuilt the casinos first. Then, as I have seen on CNN reported by a woman who is from Biloxi, every now and then would be a huge mansion left standing, with nothing around it for miles, lonely and a faint beacon of light surrounded by darkness, and more miles of driveways and trees. I think the part that was most devastating to me was the enormity of the area destroyed, the miles and miles and miles of it, all along what was once a magnificent coastal area lined with really beautiful homes. Sometimes there would be a FEMA trailer parked next to an old foundation, and sometimes the trailers were covered with Christmas lights, trying to appear optimistic in the midst of the devastation. Katrina hit 2.5 years ago, and looking at this landscape, I have no idea how it will ever rebuild. The only thing that may rebuild are the casinos, the money makers, but what will rebuild the history and family and neighborhoods. Seeing a followup story on Katrina, a gentleman talked of how his home had survived and that it was the worst thing that ever happened to him because he got no compensation, and couldn’t sell it, and his neighborhood and friends and community were completely gone. I remembered that story vividly as we drove for mile after mile along that coast. Finally at Gulf Port the road left the coast and the devastation was less apparent. The rain lessened a bit as we approached New Orleans, but it was still dark and very wet and the roads were a nightmare of bumps and construction. We crossed the Twin Span bridge that had also been destroyed in the hurricane and was recently repaired, but oh my goodness, I thought the motorhome was going to jump right out of the lanes with every bump. Somehow the cement paving was buckled and twisted and still really awful to drive. Thought for a bit we might lose the baby car, but everything held together ok.
New Orleans was dark and scary at first, but we found our way to the French Quarter Motor Coach Resort after dark. There were brick walls and cast wrought iron gates for full security at the park, which turned out to be behind the huge parking lot and empty shell of what had once been a big Winn-Dixie supermarket. The staff at the RV park offered to shuttle us to the French Quarter any time of the day or night, just a phone call would bring their little golf carts zipping down to the beautiful new information center. Just across from us, beyond the abandoned parking lot were row after row of project housing, and on the other side of us was a fenced in area of FEMA trailers. It was surreal. We could see the tall buildings of New Orleans just a few blocks away, and couldn’t understand why we couldn’t just walk the 1000 yards or so to the center ourselves, until we did in the next day in the daylight, and saw some things that helped us understand. We made use of that shuttle several times and were glad to have it. The park itself was a strange walled in world of brick and coach lights with brick cobblestone parking areas, a lovely recreation room and complex, and many rows of truly big rigs. We were right next to the I-10 freeway as well, with all the associated sound effects and lights. The funniest thing of all is that this was the most expensive park on the route so far, at 69 per night, and they wouldn’t honor the CampClub rate for Friday night since there was a big football game in town. In spite of the fact that it was New Orleans it had been a very long day and we were tired and just turned on the tv and computer where I again finally had good reception, and ate crackers for dinner. After being in Ocala Sunday evening through this morning we said goodbye to Bel and headed west across northern Florida. I had a hard time deciding where to stay this evening, because I had too many things planned for the time we really had to do what we want to do. I decided to let go of Indian Pass and Manatee springs and tried to get into Panama City Beach, but then decided instead to go to St Joseph State Park because it would be on the white sugar sand beach with clear water without all the people and it was closer and we could settle in by evening. Tomorrow will be a long day trying to get to New Orleans, and we may have some weather to deal with, but we need to get a bit more west if we are going to get home as I planned on Jan 2. Mo wants to look at a new motorhome in San Antonio, and we both want to spend a couple of days in New Orleans, so we need to get moving along. Sigh. This part of Florida lends itself to lazy beach days and dark starry nights, it’s really quiet and there’s lots to see and do that is part of the nature coast, especially the springs and rivers and beaches. I really hope that when I am retired we can come back here and spend the time it takes to really relax into this place and enjoy the water and the quietness and lack of people. I do hope that by the time we do get back here it will still have as few people as it does now. This is the Florida that I know and love that isn’t anything like the Florida that is in everyone’s mind. It is still quiet and empty with long stretches of roads through the forest that are even and straight and sometimes you see a car now and then and sometimes not. After all the hustle of living in California I just can’t get enough of these long quiet empty forested roads with no traffic. People don’t really get it when I talk about Florida this way, and sometimes I even think I am making it up, but today I was reminded that it’s real. Quiet dark night on the beach on a narrow spit of land between the gulf and the bay, listening to the low sound of gentle waves. Today I fulfilled a dream I have had since 2000 when I first started visiting Bel in Florida and saw the Silver River. I wanted to float my kayak down that river in the midst of the wonderful sights and smells of Old Florida. Of course, I didn’t even have a boat at that time, so it was only a dream. I remember one day hiking out the ¾ mile trail from the Silver River State Park one afternoon and seeing an old woman come floating down the river. It’s a 10 mile paddle with no place to put in except that one spot and she laughingly said she had to pee so bad she thought she would die. I talked a bit with her and listened to her stories of traveling alone in her motorhome with her kayak, and how much she loved the Silver. I’m not sure when that was, but it’s been awhile, before I got the kayaks, at least. Today we paddled the Silver River. It was still a bit cool for December in Florida, but I knew that I didn’t want to miss the chance to do the thing I had dreamed of doing for so long, no matter how cool it was. I guess I always get a little bit worried before we start down a new river or a new place we haven’t paddled before, something about the unknown part of it, and especially here in florida with alligators and strange water and such. It’s certainly an unknown, and that adds a bit to the allure of it all. By the time I was in the water it was noon, and the sky was still overcast, but not too chilly at all, maybe in the mid 60’s. The put-in place is at the Row Park off HWY 40 not to far from Silver Springs. The launch area is rather simple, with cement boat ramps that pour into a quiet pool lined with willows. It was still and quiet and Mo managed to get in her boat without too much trouble, although we weren’t sure how the getting out would be. Her rib is healing slowly. Once you put in, there is a narrow canal lined with lily pads and overhanging trees that leads to the confluence of the Oklawaha and the Silver Rivers. I used the GPS because it would be easy to miss that canal on the return trip, everything blends together. Once we turned up the Silver River the water showed that legendary clarity. There are springs all along the entire reach, not just the big Mammoth Spring at the headwaters of the river. Some of them are 30 feet deep, some of them are 80 feet deep, and as you float over them you feel the boiling churn of the waters and can see huge fish, including the prehistoric looking alligator gars that are 6 to 8 feet long. The river winds and turns through what feels like a tropical jungle, with a 5 mile per hour current that didn’t feel as difficult to paddle as I thought it might. I knew that we would make the return trip a lot quicker than going upriver, so wasn’t too worried about our time. We planned 3 hours to the spring, and originally didn’t think we would necessarily go all the way, but once we went a few miles it just seemed silly to not actually go all the way. The last mile or so of the river is amazing because it seems to get bigger instead of smaller with more and more springs. Some of that water must be going underground again, because downriver has quite a bit less volume. The most amazing part of the paddle though was the wildlife. Every bend would reveal dozens of water birds, not just a single bird here and there, but cypress trees on either side of the river filled with white Ibis by the hundreds, that would take off ahead of us in clouds. Sometimes they just stayed in the trees and it was a bit disconcerting to see the huge plops of bird poop that were falling in the river under those trees, and sometimes you just had to take your chances and hope you wouldn’t get bombed. In the midst of the Ibis were Great Egrets by the dozen and Great Blue Herons, and they would fly in front of our boats 2 or 3 at a time. Rounding one curve I remember the spectacular vision of 3 Great Blue Herons, at least 6 Great Egrets or white herons, not sure which,, several hundred Ibis, a dozen annihingas and 5 turtles on a log. It was overwhelming to see so much at the same time. Another bend revealed our only alligator, a 6 foot baby, dark chocolaty gray, sunning on a log. He didn’t move at all while I took his photo from a healthy distance. About midway along we saw the monkeys that are wild now in the Silver River State Park, released either from some concession in the 30’s or from the Johnny Weismuller Tarzan movies that were filmed there about the same time. When we finally began the approach to the Silver Springs Park, it was surreal. The Jungle Boats and Glass Bottom Boats were coming down the river with the captains telling the stories of the springs on the microphones, the train ride in the forest was hooting the horns while the conductors called all aboard, and Christmas music was wafting through the trees. After so many miles on this seemingly wild river I felt as though I was in some kind of strange Disney ride. We paddled all the way into the main area of the springs, looking deep into that chasm of blue and boiling white water. I have been to Silver Springs several times, but on this day I saw it from a completely different perspective. I can only imagine how the Spanish explorer Hernando De Soto felt back in the 1500’s as he paddled up this magic place for the first time. The Indians of course, used the river for hundreds of years and considered it sacred. Mammath Spring is called just that because the mammoth bones that have been found there also showed spear marks, and they believe that the springs have been inhabited by humans for more than 10,000 years. Silver Springs is a magical place, a piece of old Florida with a beautiful ecology and a campy recent history of movies and theme parks that makes it unique in the world. I loved it, and I loved being there in my kayak. Reluctantly we turned back downriver, realizing suddenly that we were looking at nightfall and darkness and that we needed to get moving along. The ride back downriver was twice as fast at least, with the 5 mph current gliding us along effortlessly. It was difficult to keep from just letting the boat glide along listening to the silence, but we managed to get back up the canal, out of the boats and get them loaded onto the top of the Geo just a bit before dark. A perfect paddle, a perfect day, a perfect dream. I felt like it was some kind of jungle ride, but because of the frost the night before, we didn’t even have a single bug to worry about. Maybe green trees in the summer would have been a bit more colorful, but I’m not sure the price of bugs would have been worth it. Ahh. Another reason for the trip. In Florida at Bel’s house, stayed around home most of the day and then went to the Holiday Light show at Silver Springs. Bel didn't want to go, so we made a light supper and shared it with her before we left. It was cold even for December in Florida and we took a comfortor and gloves and scarves. Walked around the park to look at lights, had a cup of hot chocolate and sat all bundled up in the comfortor waiting for the boat parade scheduled for 8pm. Listened to some Christmas music by a local choir and watched people wishing they had our comfortor before we gave up and left without seeing the boat show. It was enough, and nice to get back to the warm MoHo and the kitties. We are driving south on Highway 17 from Savannah to Jacksonville and then will head west on 301 into Ocala. We are near Brunswick and just passed over another one of the beautiful white suspension bridges near Jekyll Island. All these sea islands are places that are really popular with the east coast crowds and I have read about them so much, so it’s fun to see them, and see more of this amazing “low country” full of water, estuaries, marshes, salt marshes, islands, and then more water. The wind is blowing fairly hard and Mo is working hard to keep the MoHo on the road, but so far so good. There are small bays and rivers everywhere and shrimp boats and tug boats, I’m really glad that with all this wind we aren’t trying to do the interstate and that Highway 17 goes all the way to Jacksonville. Beginning out third week of travel this morning with the first hint of some weather coming at us. Mo slept well in spite of her injuries but is still feeling somewhat uncomfortable when she has to move around too much. Seems as though she bruised or cracked her left back rib area and it’s pretty sore. As awful as it was, I am just really grateful it wasn’t any worse and she is healing up ok. This morning we woke in the dark, and made coffee to take on the sunrise beach walk. The beach was quiet and lovely, and the sunrise was not spectacular, but still nice to be on the beach at that time of morning. Walking barefoot in the water in December isn’t bad either. Skipping breakfast this morning we decided to go to Tybee Island and spend the night tonight. There were some interesting people at the campground, a strange old man with a strong SC drawl and a big floppy hat who rode around in his golf cart and talked to everyone, another younger man who just seemed way too interested in talking to a couple of old ladies about sharks and alligators and kayaking. We met a lovely couple who had retired from the Air Force and returned to her homeland here in South Carolina. She was truly lovely with a beautiful accent and wishing us safe travels. She has a great Standard Poodle who was only 8 months old and looked as though he was 3 feet at the shoulder! There were also a lot of cats in the park running wild, feral cats that would cruise around the campsites looking for goodies. Jeremy really loved watching one pretty little girl particularly. We put the cat cage out on the table and Jeremy really loved being outside and watching everything. It’s cloudy and a bit windy now as we drive south along HWY 17 on the way to Savannah and Tybee Island. Predictions are for a big rain storm tonight which is badly needed in the south, but I would like to be safely set up before it starts I think. Planning lunch at the famous Tybee Island Crab Shack this afternoon and then checking out River Street in old town Savannah. 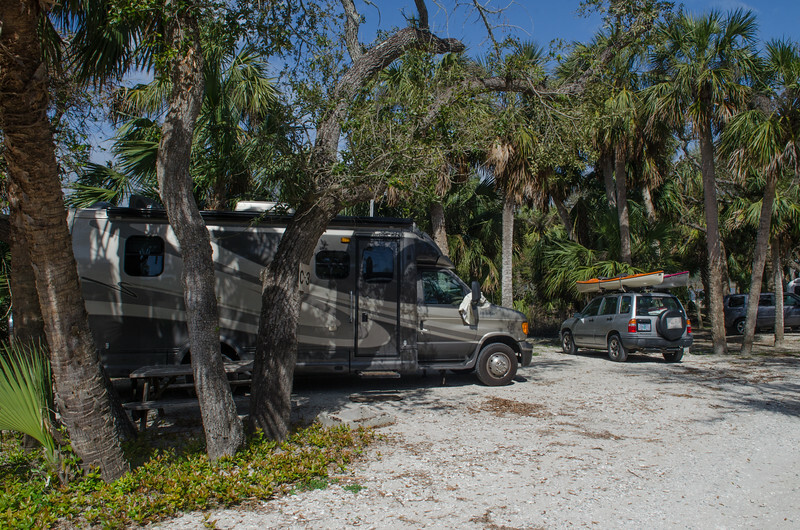 We found the River’s End RV park on Tybee Island, the only rv park within driving distance of savannah and settled in for the evening. It wasn’t cheap at 35 bucks for a night, and the sites were along a residential street. Wasn’t too bad though, since the place wasn’t very full and we had no neighbors, and we had full cable tv, fast wireless internet, and laundry facilities. A buck seventy five each to wash and to dry is a bit steep however. But after a week and a lot of wet towels and dampness, we were really glad to get things washed. Heading back to the Lazaretta bridge to the famous Crab Shack was a real treat. I read about this place on tybee many years ago when reading about the low country of Georgia and South Carolina in Southern Living Magazine, and have always wanted to go there. It didn’t disappoint me, with big wooden tables with garbage cans in the middle under open holes where you throw your crab and shrimp shells. I had the “low country boil” a mess of food that I have read about that I think Bubba Shrimp Company only tries to copy. It consists of shrimp,, some kind of sweet sausage, corn on the cob and potatoes all boiled up together with some special crab shack seasoning and the whole thing was just scrumptious. Of course, the Key Lime Marguerita and the Key Lime Pie for dessert made it fun as well. Then we went over to the Crab Shack gift house called the cat house because cats have free reign of the place and bought our tee shirts. I figured the Tybee Island Crab Shack tee shirt could be my shirt purchase for this winter’s trip since it represents the farthest distance from home that we will be this year. Later after that great early supper we drove into Savannah to check out River Street, the place that Peg said shouldn’t be missed while visiting Savannah. The streets were made of old stones that were used as ballast in the ships and then made into streets, the buildings were the originals built in the 1700’s, old warehouses used for cotton and slaves. Many flags have flown over Savannah, including the Jolly Roger and the pirate history here is thick. The other thing Savannah seems to be really famous for is it’s hauntings, called the most haunted city in America. I can certainly see why with all the political and cultural ills that have befallen the city over the last 200 years. The man named Oglethorp who designed the city built it in the mid 1700’s and laid it out with wide avenues and many public squares in a regular pattern. He build the city and selected the inhabitants who were people who had a vested interest in finding a new life in a new world, but who also had good skills. He thought that Savannah had the climate to provide silkworms for silk and grapes for wine so that England wouldn’t have to buy these things from foreign countries. The city has a great feel to it, southern and cosmopolitan without being too big and overdone. It was a great evening walking along the Savannah River enjoying River Street. Home to our cable tv fairly late in time to hear the sirens come on the channel warning of tornados in a wide swath from Florida up through the Georgia and South Carolina coast, but the night left us intact with just wind and rain and by morning all was clear and the temperatures went from warm and humid to brisk, dry, and windy. This day was planned to be a short one driving to Edisto Island, another part of the Low Country and not far from Charleston. Took our time packing up and wandering down the back roads to our new digs at the Beach State Park. This place turned out to be our most favorite of the trip, at least thus far. The campground is right on the beach, with our campsite just over the dunes and within ear shot of the waves. Stopped at the grocery store to get groceries for a spaghetti and salad dinner and decided to eat the salad for lunch and the spaghetti for dinner later. Perfect plan and easy to manage in our small kitchen space. The temperatures were still warm and balmy so we set up the chairs and table outside and relaxed a bit to the sounds of the sea. Perfect. After some relaxing time we took off walking the beach hunting for shells and letting Abby swim. I even relaxed enough to read my book and enjoy a quiet supper and a little local tv. This morning I got up early enough to watch the sunrise over the beach and see the flocks of pelicans and pods of dolphins swimming south along the shore as if they were going to town to work. We skipped breakfast and went to town to talk to the local kayak shop about local kayaking areas. I can’t believe that I never thought about the tide part of estuary kayaking, but I am sure glad that someone mentioned it. We found out the tides were just right for what we wanted to do if we left quickly, so we headed for the Live Oak dock on Big Oak Creek and turned uptide towards the refuge areas. At first the ride seemed a bit boring, without much variety in the views, but as we continued, things started to become more interesting. It’s as though it takes a bit of time to settle into a new area, and feel what it has to offer. There were a lot of birds, egrets, herons of several kinds, terns, and others that I didn’t recognize. Along the waterways are big southern low country houses with boathouses as big as cabins and big sailboats moored. I bought a waterways map so had a bit of an idea of which way to go and found a place called “the Neck” which turned out to be a very exclusive neighborhood off huge homes along the waterfront. It was fun wandering around in there for a time before the tide turned and it was time to head back down. For once, the kayaking was downhill both ways instead of the usual uphill hill where we are either fighting current or wind. This time there was a bit of wind, but the tide was stronger and the paddling was fast and smooth. Both of us were getting a bit tired, though, and ready to be home when suddenly a dolphin surfaced in front of me. Talk about highlight, kayaking with dolphins is really something. They are so graceful and beautiful and very fast. Of course, there’s a bit of apprehension that accompanies the excitement because who knows if they will bump your boat or something!! One particular dolphin stayed with us a long way, surfacing and diving sometimes within 20 feet of us, but most of the time he was a few hundred feet on the right. It was the final delight in a lovely day that was marred a few moments later by a nasty fall as Mo tried to get out of her kayak at the landing and slipped and fell on the cemented oyster shells along the rocks. She was cut in several places and bruised or broke a rib, blood falling everywhere into the water and that sick sick feeling when you don’t know how bad it is and if you need a doctor or not. We had laundry in the car so tore up a towel for bandages and managed to stop the bleeding but it was scary for a time thinking she might need some stitches. I did the classic thing that my daughters will remember clearly. Someone gets injured I get sick, really sick, to the point of throwing up. Now that’s really helpful! We managed to get to the park headquarters only to find out that the nearest emergency care was 50 miles away in Charleston. Maybe there was a doctor on the island, but who knows if we could have found her if necessary. After lots of soaking in salt water and a drive back to the campground, we found the first aid kit, cleaned it all up, and decided that butterfly bandages for the cut would be all the doctor would do anyway, and a broken rib is one of those things that you just deal with as well, so we nixed the need for a doctor. Mo is so incredibly stoic in these kinds of situations, and just plodded along dealing with it. After I got over being sick, I did ok as well, and all turned out ok in the end, except Mo is pretty sore from the fall and banged up a bit here and there. Her finger seems to be closing up just fine, however, and I’m grateful for that. Ended another day with a long walk on the beach after eggs and potatoes for an early supper. All in all, a good day, in spite of the moment of scariness. It did make me think of how scary it can be to deal with that kind of thing sometimes, especially if it’s really bad. I’m so glad it wasn’t. I was really glad that we decided to take it easy and camp two nights at the county park on Saint James Island because it gave us time to relax and enjoy ourselves some more without having to move. Finally got a chance to have the awning up and park long enough to put up the party lights I bought for the MoHo with the tricolored chili pepper lights as well. Very festive, but not nearly as festive as some of the big motorhomes in the park were. It was fun, and I finally got my cute lights, although I did refrain from buying flamingo lights. Wednesday morning we left around 9 so we wouldn’t get caught in too much traffic going into Charleston. It’s actually not that big a city, with maybe 80,000 population in the city itself with some communities around on the other islands that run in the 30’s. There are lots of bridges and water and Charleston was every big as magical as I thought it would be. We went first to the Visitor Center where they even had garage parking especially for RV’s, which worked out great since the boats were too high to fit under the poles in the regular garage parking. The visitor center was another digital wonder of the state of South Carolina and helped us a lot in understanding what to see and do on foot in Charleston. Thanks to a SC magazine we got at on of the centers, we knew about Justine’s Kitchen, so when we passed it on our walk we recognized the name. Justine was the daughter of a slave who worked for a woman in Charleston and took care of her children. Justine lived to be 112 years old and her cooking was legendary. One of the daughters opened the restaurant and it has been written up in Southern Living, the New York Times, Conde Nast, and many other publications as one of the best southern restaurants that exist. Lunch at Justine’s was a highlight. Actually sitting next to us was a reporter from some food show on Sirius radio who was recording his gastronomic experience and talking to the owner while we ate. The best part is that it was so comfortable, homey, and warm. I had an awful time choosing from a menu of southern wonders, and finally settled on a pork chop, baked macaroni and cheese, and fried okra, with pecan pie for desert, and of course a big glass of sweet tea. It was a meal made in heaven for my inner southern soul and the addition of some kind of sweetened vinegar fresh cucumbers and the hush puppies we had given to us on the street made it all the more magical. After exploring as much as our feet would allow, we went back to our park to give Abby time to swim in the great dog park and play with all the other dogs. She is finally beginning to understand that she is a dog but still isn’t quite into all the friendly puppy play and keeps looking back at her mom for approval. But she does love to swim and loves to play ball. Lots of other dogs there playing ball and swimming, and even a dog washing area as you leave the park to get all the sand and mud off the doggie paws. After our little respite, we drove back into Charleston to explore the Pleasure Island part of town east of the river and to drive over the Ravenel Bridge, the longest span in this part of the world, white, dramatic, and gorgeous. Checked out the beaches at Mt Pleasant, then found our way back home through the light show to settle in for the evening and rest our weary feet.